US experts just returned from North Korea say they have not seen any proof that Pyongyang has made a nuclear bomb. 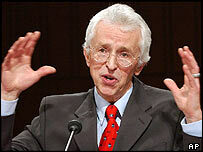 But leading nuclear scientist Siegfried Hecker said he was shown what appeared to be weapons-grade plutonium. He said it would be a mistake to conclude that North Korea could not build an atomic bomb. The comments came as US Secretary of State Colin Powell expressed the hope that North Korea would give up its nuclear weapons programmes. "We're not looking for a conflict," he said in an interview for a local radio station in Atlanta, Georgia. "We want denuclearisation of the peninsula... And I think we'll get it and I think the North Koreans will be better off when they have irreversibly and permanently eliminated this capability." Mr Hecker, former head of the Los Alamos National Laboratory, told Congress how the North Koreans had taken him on a tour of the top secret Yongbyon nuclear plant. He said spent nuclear fuel rods stored under international supervision until a year ago had been removed from storage ponds. The North Koreans were eager to show him the big reprocessing facility nearby where they say the rods were converted into weapons-grade plutonium. But after Mr Hecker showed scepticism his hosts sprung a big surprise. "We are in a conference room and they brought in a red metal box, opened that, and inside was a white wooden box with a slide-off top, they opened that up and inside were two glass jars," he told Congress. "The second jar - they said - that's the product, that's plutonium metal." A Geiger counter showed the presence of radioactivity, and Mr Hecker was reasonably certain the metal was genuine. But the North Koreans failed to persuade him they had mastered the technical challenges involving in making a bomb. "To go from the metal to a nuclear device is a bit like going from saying I have a piece of steel, and because I have the piece of steel I know how to make a final automobile," he later told the BBC. Nevertheless BBC State Department correspondent Jon Leyne says the evidence shown to Mr Hecker fits the picture painted by intelligence and other analysts. A report just released by the International Institute for Strategic Studies in London warns that the present deadlock in negotiations just gives North Korea more time to produce more nuclear weapons. "Time is not on the American side," North Korean Deputy Foreign Minister Kim Gye-kwan told the American delegation that included Dr Hecker. "As time passes our nuclear deterrent continues to grow in quantity and quality." 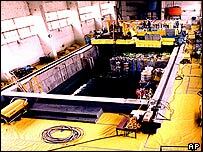 But Mr Hecker's team also examined a bigger reactor at Yongbyon which could have massively increased North Korea's nuclear capacity. He said it appeared the project had been halted and had little prospect of restarting. Our correspondent says the fact that North Korean officials were so keen to show off their nuclear capacity points to its real purpose - a bargaining chip in future negotiations. "As time passes the chances are that the nuclear threat will grow"